During the First World War, the Royal Pavilion was used for soldiers from India who were wounded during the battlefields of the Western Front. The Indian Army initially played a vital role in the beginning of the war. 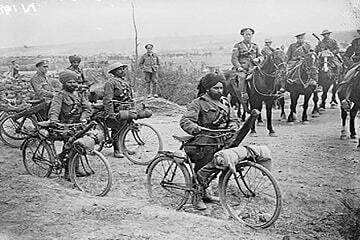 Britain was still recruiting and training, The Indians provided the largest number of troops to help support the British cause. By 1914 25% British Expeditionary Force was from the Subcontinent. As the war was fresh, fighting was fierce and energetic along the Western Front leading to many Indians suffering casualties. As the casualties grew the Western Front was not able to provide facilities and expertise. The British Government quickly chose Brighton to provide care to the wounded and sick soldiers of India. Three buildings were given by the town authorities for this purpose: Kitchener Hospital, the York Place School, and the Royal Pavilion. But the hospital was not only designed to care for the men’s medical needs. An enormous amount of effort was taken in catering for the patients’ religious and cultural needs. Muslims and Hindus were provided with separate water supplies, and nine kitchens were set up in the grounds so that food could be cooked by the patients’ co-religionists and fellow caste members. Sikhs were provided with a tented Gurdwara in the grounds of the Pavilion, and Muslims were given space on the eastern lawns to pray to Mecca. Elaborate arrangements were made for those Indian men who died in the Brighton hospitals, 18 of whom died in the Royal Pavilion. Sikhs and Hindus were provided with a site for open-air cremations on the Downs near Patcham, and Muslims were buried in a specially laid out cemetery in Woking near the Shah Jahan Mosque. In late 1915 the British decided to redeploy the Indian Army in the Middle East, and most Indian soldiers were withdrawn from Europe. As a result, Brighton’s Indian hospitals gradually closed. The Pavilion was the last to close in January 1916. In April 1916, the Pavilion reopened as a hospital for British amputees. This hospital treated over 6000 soldiers who had lost arms or legs during the war. Wounds were treated, and prosthetic limbs were fitted, but the limbless hospital did not simply care for the patients’ immediate medical needs. The Pavilion hospital was used for rehabilitation and ensuring that the men had skills and purpose to live fulfilling lives after the war. The men were also given time and space to play sports and express themselves. The Sussex game of stoolball was regularly played, and the patients produced a monthly magazine, the Pavilion Blues, which was bought and sold in Brighton. The limbless hospital received its last patients in July 1919. The Pavilion was finally returned to the people of Brighton in 1920. Having been occupied by the military authorities for almost six years, the building had suffered a good deal of wear and tear. The money paid in recompense by the War Office was used to fund some early work in restoring the Pavilion. The Indian hospital is marked by two monuments in Brighton. The Chattri memorial stands on the spot on the Downs where Hindus and Sikhs who had died in Brighton had been cremated. The Indian Gate at the southern entrance to the Pavilion was presented to the people of Brighton by the ‘princes and people of India’ as a gesture of thanks for the care provided by the town’s Indian hospitals. It was unveiled by the Maharajah of Patiala on 26 October 1921.